Our calendar is full of anniversaries. None is more poignant than those for the 10 hunger strikers who died in the Kesh in the summer of 1981. 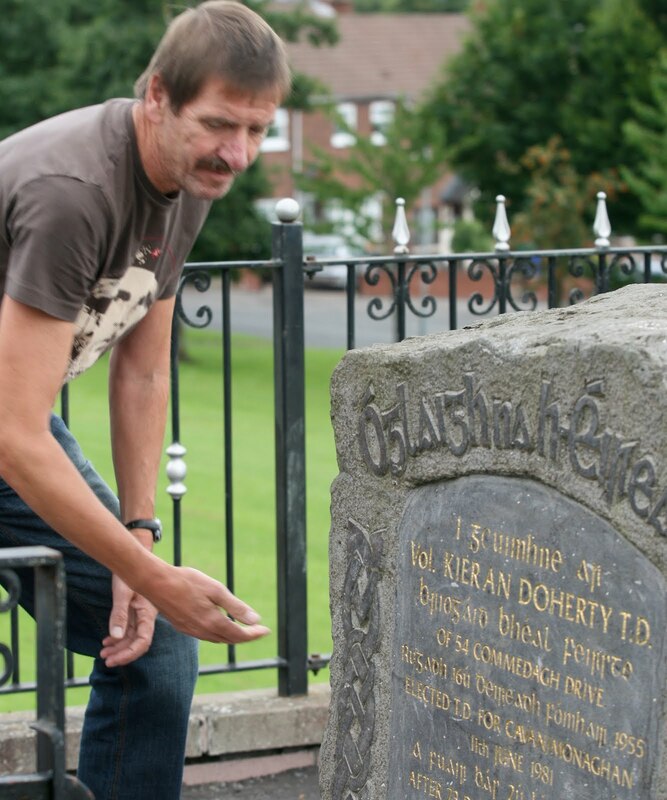 Last Monday, August 2nd, was the anniversary of the death of Big Doc – Kieran Doherty. He was 25 and had spent 7 years out of his last 10 either interned or imprisoned in the H Blocks. Like his friend and comrade Bobby Sands Big Doc stood for election – in his case in the Cavan Monaghan constituency in the general election for the Dáil in June 1981. And like Bobby he was elected. He began his hunger strike on May 22nd and after 71 days he died on August 2nd. Among those I spoke to was Kieran. He died three days later. I was awed by his dignity and courage, as he lay propped up on one elbow, in his prison hospital bed, blind as a result of the hunger strike. Doc had a word for us all also. ‘Lean ar aghaidh’ he said. Advance. ‘They think they can break us. Well they can’t. Lean ar aghaidh’, he said. ‘Tiocfaidh ár lá’. This Monday, August 9th, there is another anniversary. It will be 39 years since the introduction of internment. A policy demanded by the Unionist regime at Stormont of a British Tory government. On that morning hundreds of nationalists were dragged from their homes, many were beaten and some taken to the special interrogation centre in Holywood Barracks and tortured. Both of these events –Big Doc’s death and internment – remind us of the inhumanity of the British system, its willingness to make concessions to unionism, irrespective of the cost, and the injustice that was an integral part of its strategy to defeat Irish republicans and nationalists. For these reasons and many others republicans are confirmed in our belief that Irish reunification and self-determination can best deliver long term stability democracy and freedom. But we also need a Bill of Rights now. North and south. A Bill of Rights was part of the Good Friday negotiations. You would think that this means the issue of a Bill of Rights would be very straightforward. Not so. Instead of looking at best practice around the world and using that to quickly produce a Bill of Rights the British government’s colonial office, the ‘Northern Ireland Office,’ prevaricated, waffled, and delayed the publication of a consultation paper. It took 11 years to get that done! And the paper the NIO produced ignored much of the advice of the Bill of Rights Forum, which was established under the St. Andrew’s Agreement and tasked with reporting to the Human Rights Commission. The NIO paper also ignores the need to include economic and social protections or to address the structural inequalities that reflect our particular social circumstances. Structural socio-economic discriminations and inequalities were contributing factors to the conflict, not least on issues such as employment and housing. The routine violation of civil, political, economic and social rights – gerrymandering, right to housing, right to a job, internment and the long term suspension of many rights under emergency provisions helped exacerbate and prolong the conflict. Successive British government have systematically failed to eradicate these structural inequalities. We still see it in the institutional resistance over the last decade to the equality and human rights elements of the Good Friday Agreement. However, it is precisely that past which compels this blog and others who are intent on building a better future, to continue to demand that legally enforceable economic and social rights – which go above and beyond the current inadequate protections - are enshrined in any new Bill of Rights. The NIO consultation paper is an insult to the hard work of many sectors of society that have taken part in the Bill of Rights process for over a decade. It also proposes changes to existing equality duties. This provocative proposal has the potential to undermine the hard won equality gains that we have seen over recent years. So, there were difficult times ahead on the Bill of Right’s issue even before the last Westminster election returned a Tory/ Liberal Coalition government in London. But things have now taken a decided turn for the worst. In recent conversations with Owen Patterson the British Secretary of State he has said that the British government is under no obligation to produce a Bill of Rights for the north and that the British government will simply include a sub section in a proposed British Bill of Rights dealing with issues affecting this part of Ireland. This is not acceptable. It is a breach of the Good Friday Agreement and of the commitment by both the Liberals and the Conservatives to uphold it. Should we be surprised? The north needs a Bill of Rights that is able to address the many issues that are a part of our British legacy, of partition and decades of conflict. That is a battle that will continue to be fought. Hello Gerry, Big days ahead and some hard time and good. and offer dignity and protection to all. 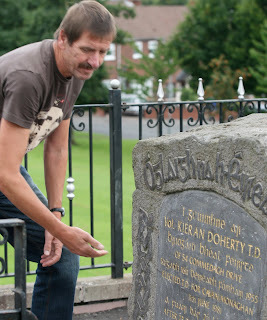 The protection that Kieran Doherty TD (Ciarán Ó Dochartaigh) should have been assured, and that dignity at Long Kesh, as a imprisoned member of the Oireachtas. Fundamental rights were rights which regulated man’s relation to political and social groups; referred to as civil and political rights. They had as purpose to protect man and the human rights needed to reflect all cultures. Resistance to oppression seems to appears,but oppression itself is flourishing. Societies are becoming more and more diverse, culturally and religiously. The need the protection of religious liberty and other human rights,even the extremists among them. It should be acknowledged that democratic governance is an indispensable characteristic of political organisation as far as compliance with human rights is concerned. The british system is indeed shockingly inhumane. There is no british state really. There is only the establishment and there connection with the military. Power revolves around that. If you committ a crime against those connected with that, you'll go down for a long time. If you're an ordanary "citizen" and a crime is committed against you, banality will be the response. Recently an elderly man was "happy slapped" outside a mosque. He fell dead on the ground. He was with his three year old granddaughter. She was distraught and howling with disturbance in between trying to console him. The killers, who had too much bad form, got derisory sentences. One is already out for time spent on remand. The banality of evil best sums up the british system and this is in England. At least in North Ireland the people have a capacity to challenge it and the right to vote out of it. The sooner the better, when the self-interested, self-serving pigs of unionism are properly vanqueshed.